Welcome to Okay, I Finally Watched It, an occasional feature where TWTV writers discuss their experience with shows generally viewed as classics. If you follow my writing (and obviously, you do), you probably know about the Test Pilot series I’ve been spearheading over at my other stopping grounds, TV Surveillance. * Hopefully you also know that recently, Josh Spiegel and I covered one of the most popular shows of all time, Seinfeld. I won’t belabor the point too much because you should check out that piece, but before sitting down to watch the pilot episode for Test Pilot, I hadn’t seen much of Seinfeld. Obviously, I’ve had a television over the past two decades, so I had seen bits and pieces, and maybe even a few full episodes, but still, I was unfamiliar with a comedy that many would call the greatest in its genre. *If you don’t know about Test Pilot, please check out the series. The feature has shifted a bit over time but generally speaking, it features a guest and I discussing pilot episodes. We’re up to over 50 entries, with no end in sight. Watching that first episode of Seinfeld only made me want to watch more (an effect Test Pilot often has on me), and because it’s much easier to take a flier on a half-hour show, I devoted myself to watching a handful of episodes at random times over the last six weeks. As of now, I’ve only made it through the first two seasons, which isn’t even much of a dent in the grand scheme of things, but this space feels like the best one to share some thoughts on my initial experience with Seinfeld. Hey guys, I don’t know if you know this, but Seinfeld is really funny. And… end criticism. More seriously, the thing about catching up on television you’ve missed that you’ve actually read a lot about is that your expectations are dramatically shaped by everyone else’s opinions. So although I expected good things from the show based on its reputation, I also assumed that the first two seasons would be troublesome and unfunny at spots. But just like when I reviewed the pilot for TP, I found that the rest of the first season and the second season were both funny, pointed, and well-constructed. The first season’s five episodes see the show feeling around in the dark a little bit, particularly with Kramer’s character (who is famously not named as such in the pilot) and the conjugation of the disparate narrative threads in the climax. “Male Unbonding,” the second episode produced (though it aired fourth), introduces the convalescing approach but it results in very little other than the characters being in the same room together. The payoff isn’t that impressive. As the first season continues (again, going by the production order), Seinfeld improves with each episode. “The Stake Out” is a little silly, but works because it focuses on one of the show’s early strengths: Jerry and George making fools of themselves in ways of love. “The Robbery” succeeds for a similar reason thanks to the pair’s awkward waffling over who gets to grab a valuable apartment. Both of these episodes display a show that has a pretty solid command of its two main characters, which is a crucial development for a comedy just starting out. Jerry Seinfeld (the person) isn’t a particularly strong performer here, but he has good chemistry with Jason Alexander, who is already in damn good form as George. 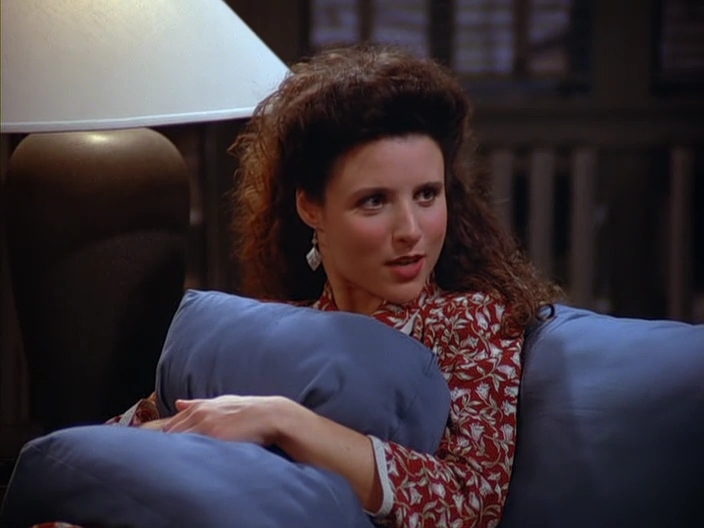 But the season one finale, “The Stock Tip,” feels like what I always imagined Seinfeld was. There’s a story about disastrous dating practices as Jerry pushes a relationship too soon, too fast, another thread about plans-gone-wrong with Elaine trying to figure out a way to ditch cats that make her sick, and a fun schadenfreude-y runner about the group fretting over an investment George pitched them on. By the end, everything blows up, especially for Jerry, who loses the girl and misses out on the investment opportunity because he cashed out too quickly. The episode isn’t necessarily laugh-out-loud funny, but it works on a fundamental structural level. Season two of the show continues that nice, methodical progression. I won’t waste time burning through every one of the 12 episodes, but most of them work really well. 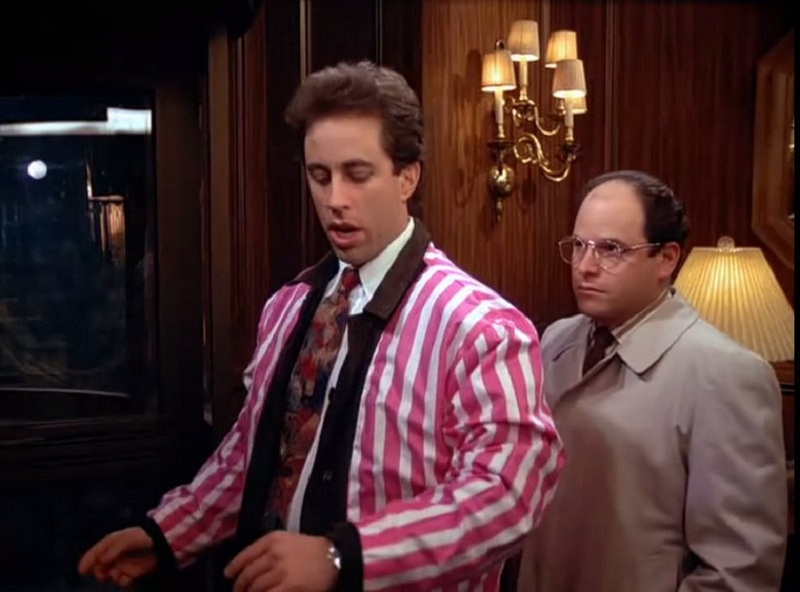 “The Ex-Girlfriend” and “The Phone Message” continue the show’s strong failed love-related episodes, “The Revenge” and “The Busboy” include a great deal of bad decision making on George’s part, and “The Pony Remark” and “The Jacket” allow Jerry to look like a massive idiot as well. Obviously, “The Chinese Restaurant” is its own kind of narrative marvel. Much of this second season keeps Elaine and Kramer in supporting roles, which I found odd based on my assumptions that this was more of an ensemble show, but perhaps it is the working norm from here on out. And there are episodes that miss, whether because the jokes aren’t particularly funny or the narrative dips its toes in the deep end of zany and ridiculous. “The Statue” and “The Heart Attack” struggle with both of those issues, and “The Revenge” is simply not as humorous as the other 11 episodes. Still though, as in the first season, Jerry and George are well-defined and wonderful characters. They are compelling and certainly not admirable, but I didn’t necessarily want awful things to happen to them. The characters successfully walk this weird tightrope where they aren’t heroes and they aren’t villains, they’re just sort of people who get stuck in odd situations. Much has been made about the show’s lack of morality, and in these early episodes, Seinfeld suggests that when faced with a choice, take no action over trying to make something happen. There are times when the show’s narrative comes hunting for the characters, but more often than not, they’re victims of their own stupidity or choices. I quite enjoy that dynamic and it obviously leads to a lot of laughs because the show isn’t really afraid to make anyone look like a massive fool. That’s important. These observations probably aren’t that novel—in fact, I know they aren’t. However, with all the random knowledge I had about Seinfeld, I assumed that these episodes would start off really poorly and slowly get better as I moved into the late portions of the second season. We watched the Seinfeld pilot for Test Pilot because most people consider it to be fairly weak and part of a messy origin that places the show alongside fellow comedies like Parks and Recreation or even The Office. But in my estimation, Seinfeld came out of the shoot way more fully-formed than either of those two shows and frankly, more than most sitcoms with which I have spent at least a season or two. We talk a lot about comedies trying to find their voice and make the characters fit with the performers. With Seinfeld, those things are pretty much in place from episode two or three and from there, the show simply gets its reps in to improve on what is already a great core. In that regard, it might be time to revisit these early episodes. Or maybe Seinfeld is just so good that the rest of the Larry David-run seasons destroy these first two. That’s entirely possible and I’m certainly going to be watching to find out if it is. Nevertheless, it’s been nice to catch up with the show and key in to the elements that made people so gaga for Seinfeld more than a decade ago. I was a big fan of Seinfeld for years, and yes, I watched it when it was first run. The more I see of the reruns though, the more I realize that the 4 main characters are fundamentally unlikeable. They scheme, they lie, they are out for themselves alone and care little about how their antics affect others. They are shrewdly devious and intriguing, but I wouldn’t pick any one of them as a friend. Now when there is nothing else on and I settle on a Seinfeld episode, the show makes me cringe. On an up-note, they get what they deserve in the series finale.